At Dare Devil's Pizzeria, we have a large selection of delicious menu items that the whole family can enjoy. All of our dough and sauces are made fresh daily. To browse our menu selections, please click on the tabs below. for the true Dare Devil. Very HOT!!! Our famous wings covered in tangy barbecue sauce. Perfect pizza for one person. Pizza sauce and cheese on French bread. Delicious and homemade! Sticks the Dare Devil way! Served with our famous stromboli sauce. For the Tex-Mex in you. Crisp tortilla chips covered with chili, melted cheese, jalapeno pepper, diced tomato, onion, shredded lettuce and a side of sour cream and salsa. Toasted garlic bread with melted cheese; enough for two. Served with marinara sauce. Sweet onions lightly battered with a kick and fried. Served with ranch dressing. Breaded jalapeno peppers stuffed with cream cheese. Not too hot but just right. Served with salsa. Breaded cheese sticks fried to perfection. Served with our famous stromboli sauce. All subs served with chips on an 8" sub roll. Shredded chicken grilled with onion, green pepper and tomato. Served on a sub roll with melted cheese, mayo and our homemade Italian dressing. Truly Italian; Capicola, Genoa salami, mortadella and provolone cheese, our homemade Italian dressing, lettuce, tomato and onion. Served hot or cold. Smoked ham with provolone cheese, lettuce, tomato, onion and mayo. Served hot or cold. Smoked turkey and provolone cheese, lettuce, tomato, onion and mayo. Served hot or cold. Onion, green pepper, mushroom, tomato and black olives. Covered with provolone and our homemade Italian dressing. Served hot or cold. Served with a house salad and garlic bread. Choose either our traditional pizza sauce, pesto sauce or our delicious white garlic sauce. Locals' favorite! Our garlic pizza topped with feta cheese, spinach, oregano and fresh tomato. Our handmade dough covered with pesto sauce, cheese, tomatoes and mushrooms. Pepperoni, sausage, beef, ham, mushroom, green pepper, black olive, tomato and onion. Our regular pizza topped with pineapple and ham. Onion, green pepper, mushroom, tomato and black olives. Pepperoni, sausage, beef and ham. Our homemade dough covered with BBQ sauce, cheese, chicken, bacon and onions. Baked chili, cheese and onion pizza, topped with crisp lettuce, fresh tomato and grated cheese. Served with a side of jalapeno peppers, salsa and sour cream. A delicious blend of cheese, stromboli sauce and the stuffing of your choice, encased in fresh dough and baked to a golden brown. Choose any number of stuffings from the pizza toppings list and create your own stromboli! Thinly sliced ribeye steak, grilled with onion, mushroom, green pepper, cheese and stromboli sauce. Thinly sliced chicken breast grilled with onion, mushroom, green pepper, cheese and stromboli sauce. Chili, onion, jalapeno pepper and cheese. Served with salsa and sour cream. Onion, green pepper, mushroom, tomato and black olive along with cheese and stromboli sauce. Southern Comfort, Crown Royal, Stoli, amaretto, triple sec, cranberry, sour. Kettle One vodka, apple schnapps. Kettle One vodka, watermelon schnapps. Vodka, chambord, triple sec, sour. 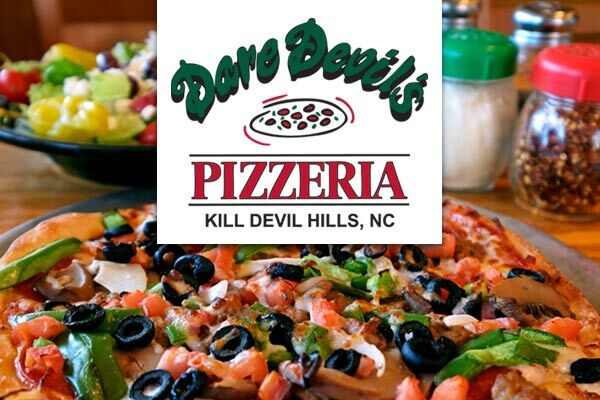 Since 1987, Dare Devil's Pizzeria has distinguished itself on the local food scene with its pizza and strombolis. Our signature dough and sauces are all made fresh in house daily.